Rhonda K. Garelick, author of Mademoiselle: Coco Chanel and the Pulse of History , joins the show to talk about Chanel’s impact on women’s fashion and French national identity, how she managed not to get tried for collaboration after the war, the one figure from our age who compares to Chanel, what it’s like teaching the accordion-and-beret crowd, and more! Give it a listen! We also talk about Chanel’s pleasure in hiring fallen royalty to work in her boutiques and factories, the need for myth-making in fashion, the challenges of getting Chanel’s associates to talk to her, the psychological similarities of fashion and fascism, and the decision to structure Mademoiselle around Chanel’s relationships. Also, I make the major mistake of letting Rhonda ask me a question, which sends the conversation utterly off the rails. So start listening! Rhonda K. Garelick writes on fashion, design, performance, art, literature and cultural politics. Her books include Rising Star: Dandyism, Gender, and Performance in the Fin de Siècle (Princeton University Press, winner of the Kayden Award for outstanding manuscript in the humanities), Electric Salome: Loie Fuller’s Performance of Modernism (Princeton), and, as co-editor, Fabulous Harlequin: ORLAN and the Patchwork Self (University of Nebraska Press, winner of the 2011 award for book design from the American Alliance of Museums). 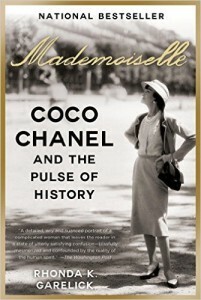 Her new book is Mademoiselle: Coco Chanel and the Pulse of History . Her work has also appeared in The New York Times, New York Newsday, International Herald Tribune, and The Sydney Morning Herald, and numerous journals and museum catalogs in the United States and Europe. 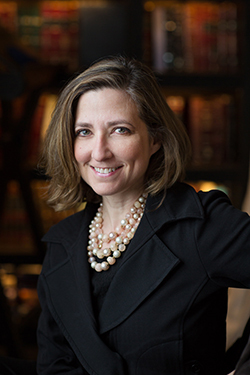 She is a Guggenheim fellow and has also received awards from the NEA, the NEH, the Getty Research Institute, the Dedalus Foundation, the American Association of University Women, the Whiting Foundation, and the American Council of Learned Societies. Prof. Garelick received her B.A. and Ph.D. in comparative literature and French from Yale University. She splits her time between Lincoln, Nebraska and her hometown of New York City. At the University of Nebraska-Lincoln, she is Professor of Fine and Performing Arts and English, as well as the founder and director of the Interdisciplinary Arts Symposium. For the academic year 2015-2016, Rhonda will be the Stanley Kelly, Jr. Visiting Professor of Distinguished Teaching in Comparative Literature at Princeton University. She has also had a long career as an international business consultant, specializing in the fields of fashion, media, and journalism. Credits: This episode’s music is Cri de Coeur by Edith Piaf. The conversation was recorded at an undisclosed location on a pair of Blue enCORE 200 microphones feeding into a Zoom H5 digital recorder. I recorded the intro and outro on a Blue Yeti USB Microphone . Processing was done in Audacity and Logic Pro. Inset photo of Prof. Garelick by Agaton Strom. Top photo of Prof. Garelick by Greg Nathan.